GRAVENHURST, ON – Sawdust City Brewing and craft beer destination Bar Hop have announced details of a sinister new collaborative beer that will be unleashed on Hallowe’en. After a long hibernation in his undersea realm Cthulhu has heard the call and has risen once again! With the help of our good friends at Barhop, we conjured up The Great Old One and created a beer in his honour. Brewed with a ridiculous a mount of malt and a mixture of raspberries, cranberries and tart cherries it expounds with flavours of rich chocolate and tart, mouth puckering fruit. It pours as black as the blood of a malevolent demi-god and throws off aromas of roasted malt, chocolate and fresh fruit. 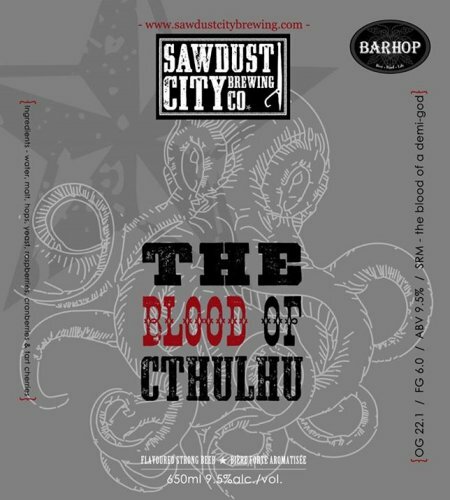 The Blood of Cthulhu will be tapped on October 31st at the Sawdust City Saloon in Gravenhurst and Bar Hop in Toronto. A limited number of 650 ml bottles will also be released on the same day, available exclusively at the Sawdust City retail store.